1. 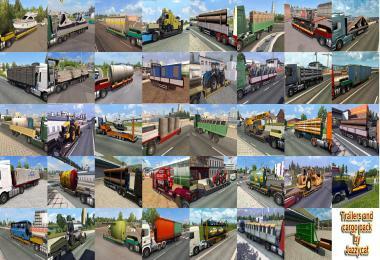 AI trucks will now transport all trailer types available in the game. 2. Traffic Panel Transporter trailers no longer shows up as the red variant only. 3. 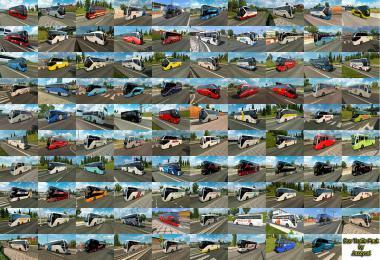 Added more variants of AI trucks (with different cabin and chassis configurations). 4. 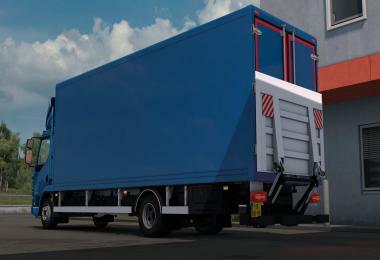 Adds missing stock exhaust to the AI DAF trucks. 5. 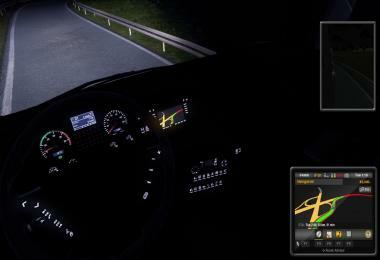 Adds missing side mirror to the AI Renault, Scania and Volvo trucks. 6. Traffic vehicles that are not set to appear in a specific country will still appear rarely. 7. 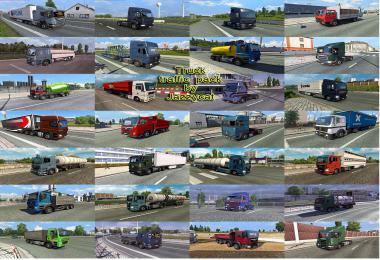 Made the MB Actros, Renault Magnum, Renault Premium, Scania R, Scania Streamline and Volvo FH16 traffic trucks use the detailed model when close up like the other trucks. 8. Fixed lod models of the Accord, Fabia, Octavia and Punto to use the correct wheels. 9. 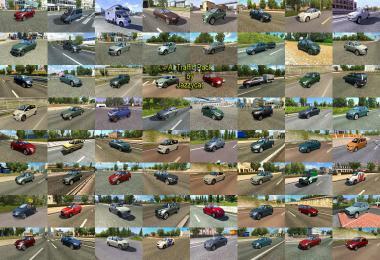 Adjusted maximum speed of some AI vehicles. 1. Missing side mirror on one of the DAF, MAN and Iveco dealers' trucks has been added as default configuration. 2. 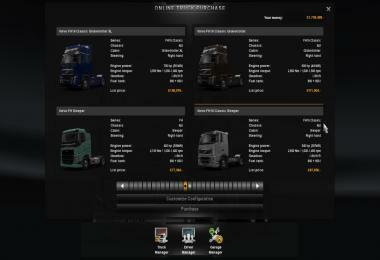 Fixed UK exclusive dashboard icon of MAN TGX. 3. 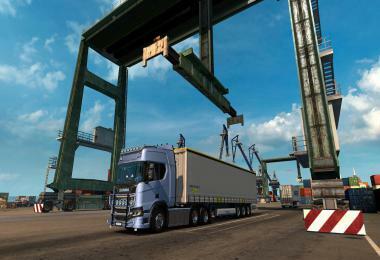 Front mirror of the MAN TGX for XL and XLX cabs has been changed to use the correct one. 4. Default paintjob of the MAN TGX 18.680 V8 has been changed to use the V8 black paintjob, while the 26.540 truck beside it now uses the Shadow gray paintjob instead. 5. 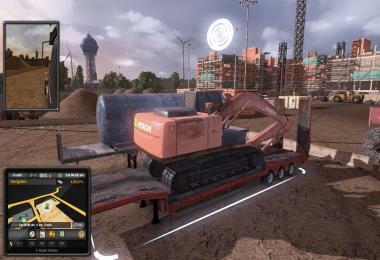 A 6x4 model is offered by the DAF truck dealer by default. 6. 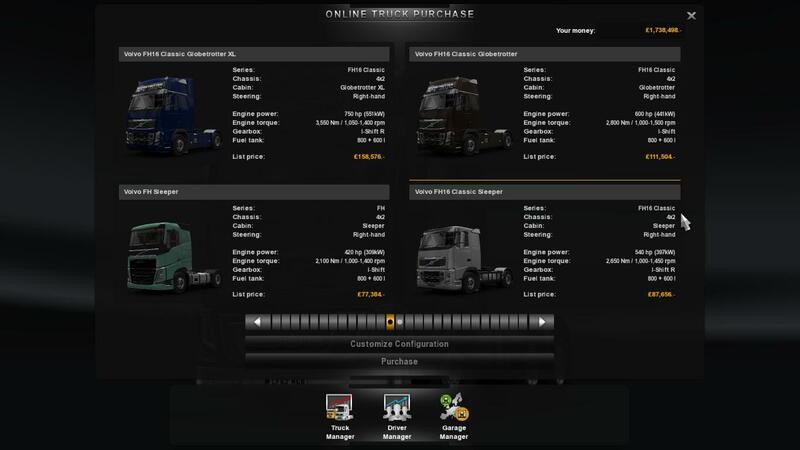 Fixed inconsistencies in the default truck configurations between UK and Europe truck dealers. 7. The top range Renault Magnum is now fitted with the 520hp engine as default configuration. 8. The Iveco Stralis Hi-Way is also available at small Iveco dealers. 9. Base model Volvo FH 420 is now available as a starter truck, while the base model FH16 540 Classic will only unlock at level 9 (at level 9 you can choose between the FH 500 or the FH16 540 Classic). 10. The FH16 600 Globetrotter 6x2 is also available at small truck dealers. 11. Missing Euro 6 badges added to the Scania Streamlines at the truck dealer. 12. 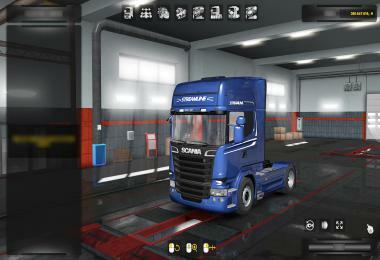 Scania Streamline default paintjob now available as stock at the truck dealers. 13. Adjusted stock exhaust pipe price of Iveco Stralis Hi-Way to match the Iveco Stralis. 14. Adjusted bubbles paintjob price of Scania Streamline to match the other trucks. 1. Added lod model to the brick explosive trailer. 2. Opentop trailer shadow bug fixed. 3. Made parked trailers use the detailed model instead when close up. 4. Fixed Gooseneck cargo 30ft and 40ft model. Previously the textures were mapped to the wrong color look. 5. Corrected wheels of the Skoda Octavia cargo on the car transporter. 6. 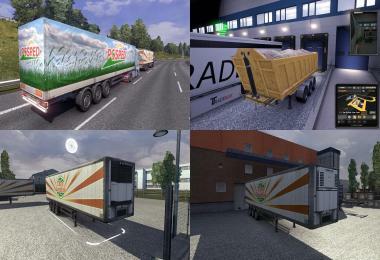 Made the Container trailer use the Schmitz universal trailer shadow texture instead of from the food cistern trailer. 7. Made the Reefer trailer use the Krone Cool Liner trailer shadow texture instead of from the food cistern trailer. 8. 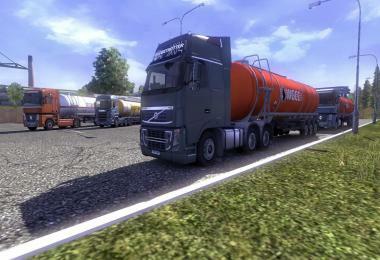 Added ui shadow for the opentop trailer in freight market. 9. 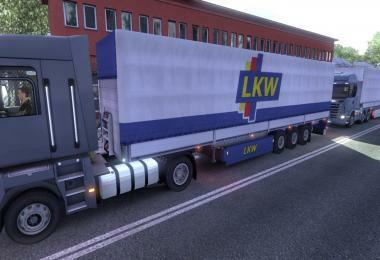 Fixed the lod models of the Container and Reefer trailers so that the trailers do not disappear from far. 1. Corrected cabin names of the Iveco Stralis and the Renault Magnum. 2. Gearbox name corrections for Iveco Stralis, MAN TGX and Renault trucks. 3. DAF XF stock left exhaust does not conflict with the right exhaust. 5. 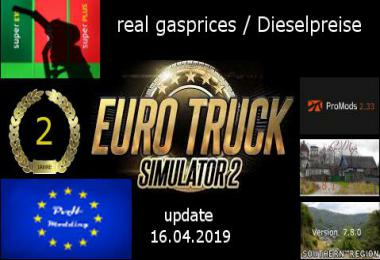 Mercedes-Benz Actros engine names corrected (no longer using the 18xx chassis format). 6. Fixed the "400" badge texture of the MAN. 7. MAN 324kW (440hp) engine type is changed to D2066, since the D2676 range only starts from 353kW (480hp) onwards. 8. 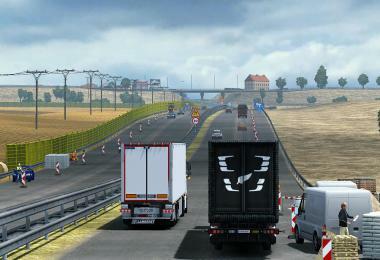 Fixed Iveco Stralis Hi-Way naming problem. It no longer shows up as the Iveco Hi-Way Hi-Way at driver manager. 9. DC16 V8 engines are also available for the Scania Streamline normal cab. 10. The sideskirt of the 4x2 Iveco Stralis Hi-Way can now be removed. 11. Default decal used for the Globetrotter XL cab of the new Volvo FH16 has been changed to the correct one. 12. Globetrotter and FH16 750 roof decals are only available for Globetrotter cab while Globetrotter XL and FH16 750 XL decals are only available for Globetrotter XL cab. 13. FH16 750 and FH16 750 XL roof decals are only available when 750hp engines are selected. 14. The Scania Streamline paintjob has been separated into two variants, the original will be the stock one that you can purchase from the dealer, but is not customisable, the other variant can be purchased at the paint shop, and can be customised. 1. Bricks, Calcium and Concrete cargo added for transport. 2. Added retarder to the DAF, old Iveco, MAN, MB, Renault and Volvo Classic first job trucks. 3. V8 black paintjob is now used by the MAN first job truck. 4. Fixed inconsistency of parts available between LHD/RHD quick job trucks as well as increased engines variety. 5. Fixed chassis badge number of the quick job MAN TGX 6X4 trucks (from 26 to 33). 6. 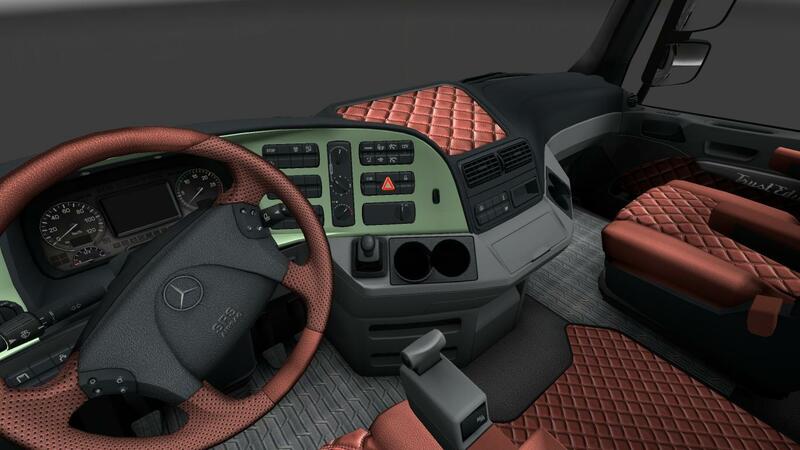 Added roof decals and changed standard interior into exclusive interior of the new Volvo FH first job truck. 7. Added the removed "Express" paintjob. 8. 520hp engine is now used by the Renault Magnum first job truck. 9. Added Euro 6 badge to the UK Scania Streamline first job truck. 1. 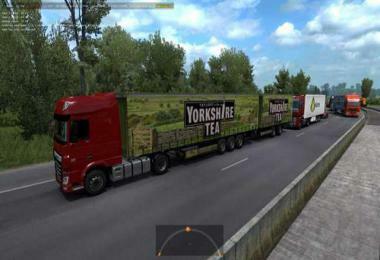 AI trucks will also transport the new trailer types. 2. 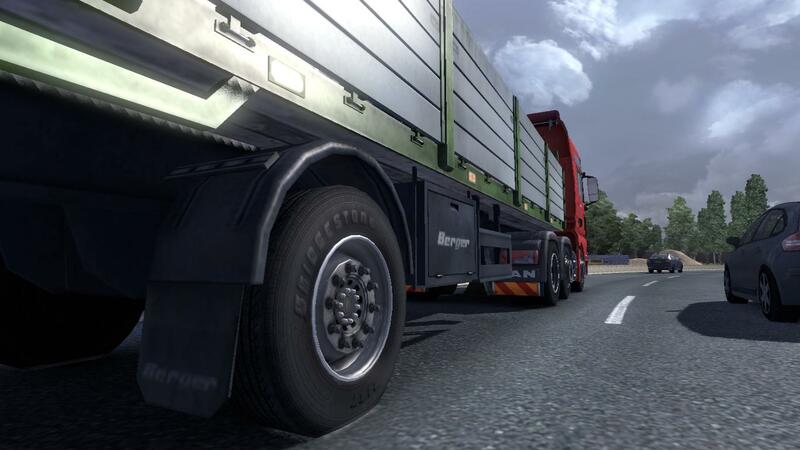 Made parked trailers use the detailed model instead when close up. 1. 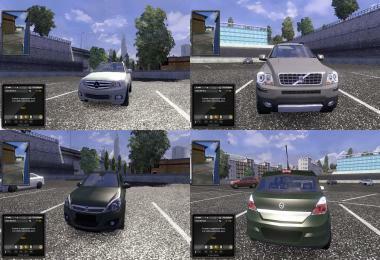 Adds real logos to Mercedes-Benz C Class wagon, Opel Astra and Volvo XC90. 2. Changes Majestic into Mercedes-Benz. 3. Changes Gestone, Continent and Goodyears tires into Bridgestone, Continental and Goodyear tires respectively. 7. Real logos for heavy duty machinery. 8. 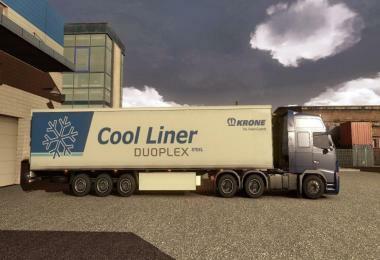 Krone Cooliner and Profi Liner trailers now use the Krone livery. 9. 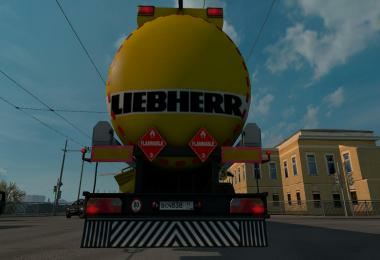 Brick trailer logos have been changed from Beger to Berger, Schwar Muller to Schwarzmuller. 10. 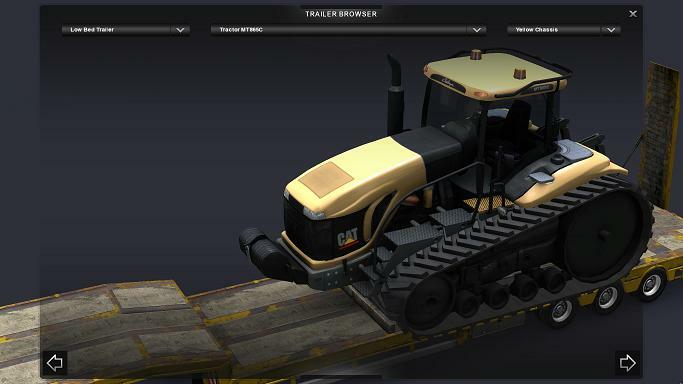 Changes trailer names of Digger 500 and Digger 1000 to Digger 422E and Digger 938G respectively. 1. Real logos for the Atlas Copco FlexiROC T45 Driller and the CAT Challenger MT865C tractor. 2. Changes trailer names of Driller D-50 and Tractor RS-666 to Driller T45 and Tractor MT865C respectively. 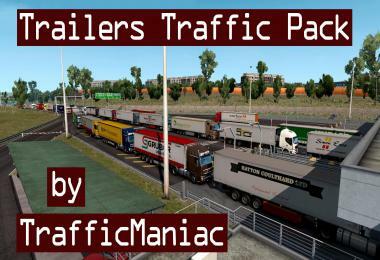 Trailers mod (EssentialsTrailers.scs), adds more stock trailers to the game. 1. Unused trailers such as the Container, Opentop and Reefer will be available for transport. 2. Adds unused red and green color variants to the gooseneck cargoes. 3. Adds unused yellow color variant to the cement mixer. 4. 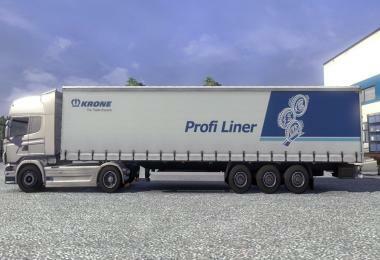 Adds a new variant of the Krone trailers, it uses the companies paintjob instead of the stock Krone paintjob. 5. Adds a new unused variant of the Schmitz container trailer, it uses the companies paintjob instead of the stock Schmitz paintjob. 6. Beverages and Peas cargo are only grouped under Refrigerated and will only use refrigerated trailers, while Packaged Food cargo is only grouped under Containers and will only use container trailers, this is to prevent non-refrigerated trailers from showing under Refrigerated and vice versa. 1. Pete379jp for the real logos of the Mercedes-Benz Actros. 2. lonestranger for the real logo heavy duty equipment.